Looking for a quick and easy dinner? Cheesy, tangy, and oh so satisfying, these BBQ Chicken Quesadillas hit all of the right notes and are perfect for a weekend lunch or a quick weeknight dinner. They are sure to please out-of-town guests or your little ones. You can cook your own chicken breast using the delicious marinade below, or just use precooked grilled chicken breasts or leftover rotisserie chicken. It couldn't be any easier. You can also make these quesadillas open faced little pizzas too! It tastes so similar to California Pizza Kitchen's classic BBQ chicken pizza. So if you're a fan of their's, we're sure you'll enjoy our version as well. We love serving them with extra barbecue sauce and a little sour cream. 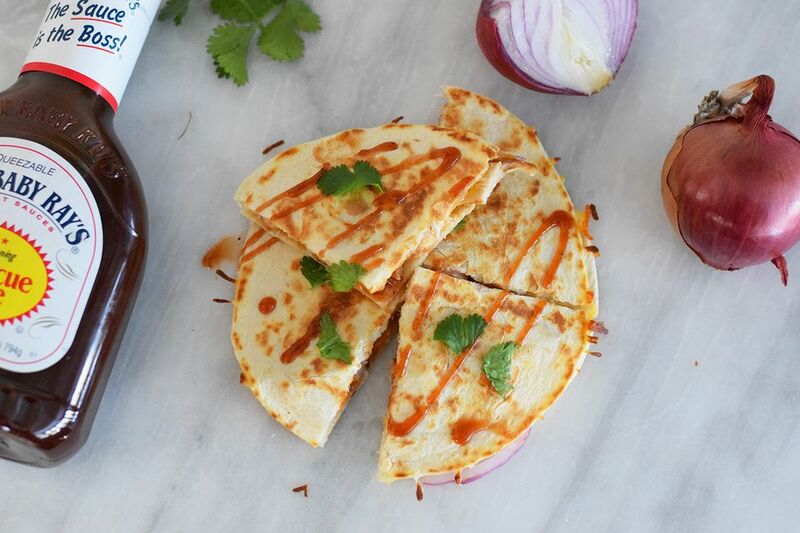 Salsa doesn't go well with these quesadillas, so they are a bit untraditional. We promise the new and unique flavor is worth it though! Split each chicken breast so that you have four halves. Place the chicken breasts in a large bowl. Whisk together the lime juice, seasoned salt, pepper, and olive oil. Pour it over the chicken. Cover the chicken and let marinade for at least 20 minutes or up to 2 hours in the refrigerator. Any longer will cause the lime juice to "cook" the chicken (i.e. ceviche) so don't let it marinade for too long! Heat up your grill or grill pan to medium-high heat, so that you will get nice grill marks. Grill the chicken for about 5 minutes on each side or until cooked through. Remove from the heat and allow to rest for about 5 minutes. Then slice into narrow strips. Toss the strips with the barbecue sauce in a medium-sized bowl. Heat up a cast iron skillet or griddle to medium-low heat. Quesadillas can burn easily, so monitor the temperature closely. Place a tortilla on the pan, top with about 1/4 of the cheese, some of the red onion and about 1/4 of the chicken. Place another tortilla on top. Cover with a lid to help allow the cheese to melt. Flip the quesadilla and finish cooking for a minute or two on the other side. Repeat with the rest of the quesadillas. You can keep them warm in a 200 F oven while you are cooking the rest of the quesadillas. Cut each quesadilla into quarters. Garnish with cilantro leaves, more barbecue sauce, and sour cream, and enjoy!